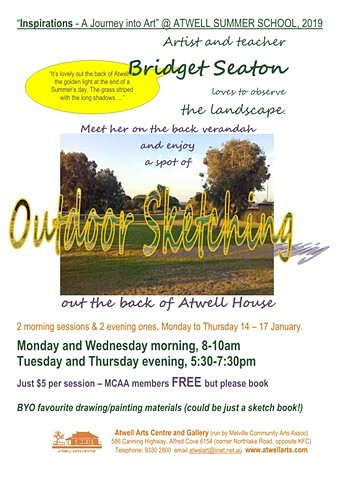 Come and try some outdoor sketching at Atwell Arts Centre and Gallery. Drawing from real life is a great way to improve your drawing and observation skills. Its all about looking and seeing. Its not so much about the end result as being in the present moment and really looking at the world in front of you. The view from the shady veranda is great with plenty or trees and even a distant city view to draw. Bring along your sketchbook and favourite drawing medium (or paints).